Spring is here! 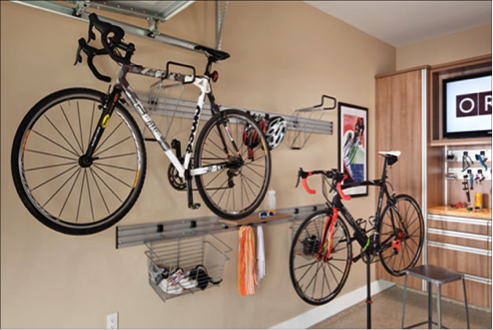 Now is the time to make space in the home and properly utilize spaces such as the garage and basement. It’s a time where you start seeing your neighbors again (whom you thought had moved away), I compare it to bears coming out of hibernation. You trade the shovel for the rake, put the winter clothes away and start spring cleaning! This is THE time to wisely spend your leftover home improvement budget. Funny story-- Last week I had a client call for an estimate on garage cabinets and organizational pieces for his garage. He said that his wife parks the car in the garage and closes her eyes to literally run to the door to get into the house as to not see all the clutter and ugly floor. He says, “we need to put a yellow caution tape around it and tell our guests to close their eyes and not trip on anything on their way into the home.” This made me laugh, however I get similar calls on a daily basis with people needing help with their space. 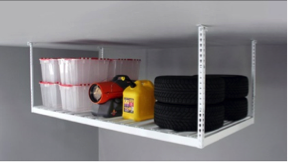 We not only make garages and basements aesthetically pleasing but clean, organized, functional and a safer environment to be in. Overhead storage is genius. What a great way to make use of an otherwise wasted space- go vertical with shelving. 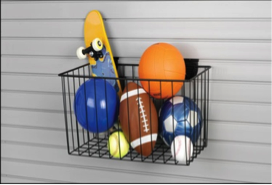 They are heavy duty, commercial rated allowing you to store heavy items. There are a variety of hoists that we can professionally install for those heavy items or those items that you want more accessible. An example would be a cargo hoist that you can store at the top. Why waste yard space with a shed full of cluttered tools when you can neatly store them all in your garage. 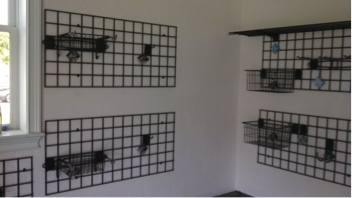 There are numerous types of wall grids, different styles and sizes and are cost effective. 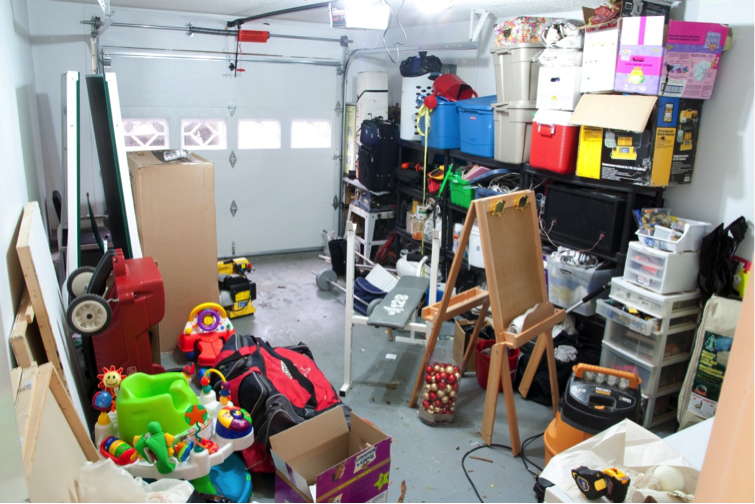 Garage cabinets are a huge clutter extinguisher, take a look at this before and after – amazing results! 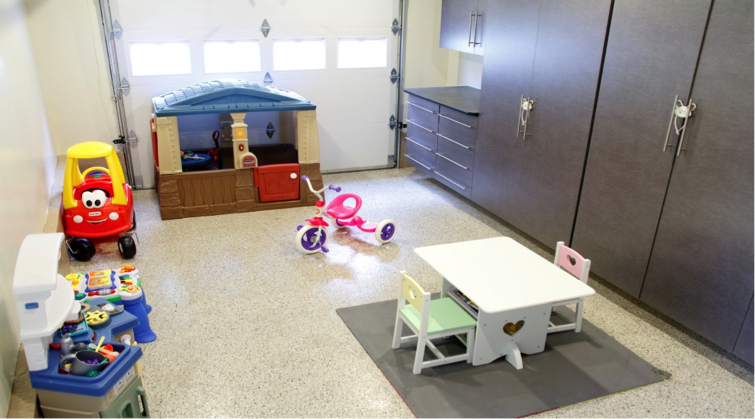 A once cluttered, disorganized, messy, tripping hazard waste of space is now pleasing to the eye, organized and an addition to the home as it now functions not only as storage but as a play area for the children. 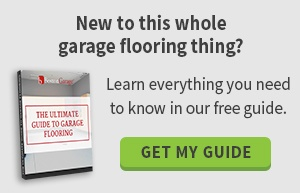 An added benefit is that they come in an array of colors and can match the garage flooring. An epoxy floor coating is another savvy home improvement project, if done by a professional, with proper preparation; it can last for many years to come, is practically maintenance free and creates a non skid surface. There are many colors to choose from and is extremely pleasing to the eye as shown in the above –after picture. Do you have bicycles, helmets or surf boards or anything large that you want OFF the ground? – Wall hooks and slatwalls are the ideal solution. Again – utilize vertical space that would otherwise be wasted. Cabinets in your garage are a great source of storage. Everything is “tucked” away. Not to mention they are available in an array of products, styles and colors. They are ¾ inch thick which is thicker and more durable than your average cabinet that is typically used for the inside of the home. The shelving is 1inch therefore sagging; de-lamination and warping are not an issue. Our expert designers can design the perfect combination of cabinets that suites your specific needs based on your style, taste, and size of the garage and what you want to store. The above are all space saving tools, that can make life simpler, more organized yet cost effective. One of our designers can design your space to suite your lifestyle, taste and budget.